Pondside Trail is a 0.25-mile loop around Goose Pond, with interpretive posts numbered clockwise. It also provides access to three other trails; Red Pine Trail, Big Stone Creek and Wilkenhs Trail. 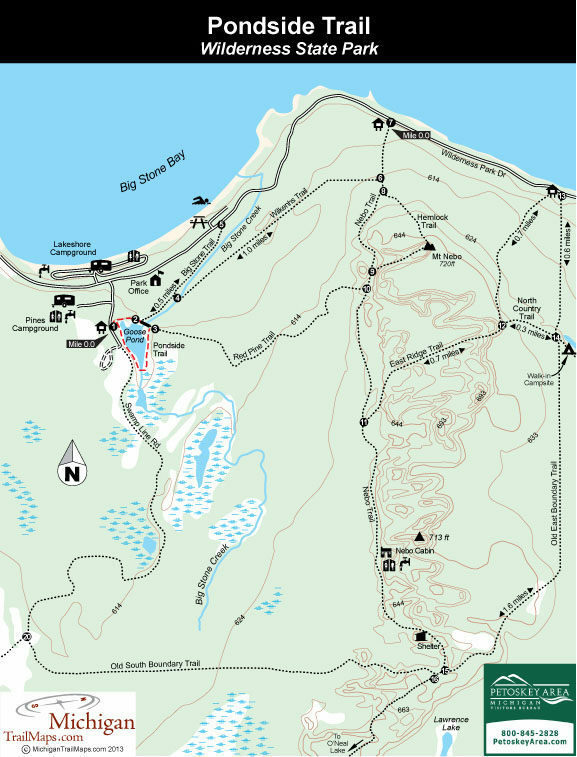 The trailhead for Pondside Trail is located a short walk from the Pines Campground entrance and is marked by post No. 1 and a large display map. Pondside is an interpretive trail that never leaves the edge of the pond and features fifteen posts pointing out a variety of trees and other plants. Not all the post may still be standing. Within 200 yard yards you pass a view of the pond and then reach post No. 2, marking the junction with Big Stone Trail and Wilkenhs Trail. You then cross a bridge over Big Stone Creek and reach post No. 3, marking the start of the Red Pine Trail. Pondside then heads to the south end of the pond where it crosses another wooden bridge that runs along a beaver dam before swinging north to return to the trailhead.